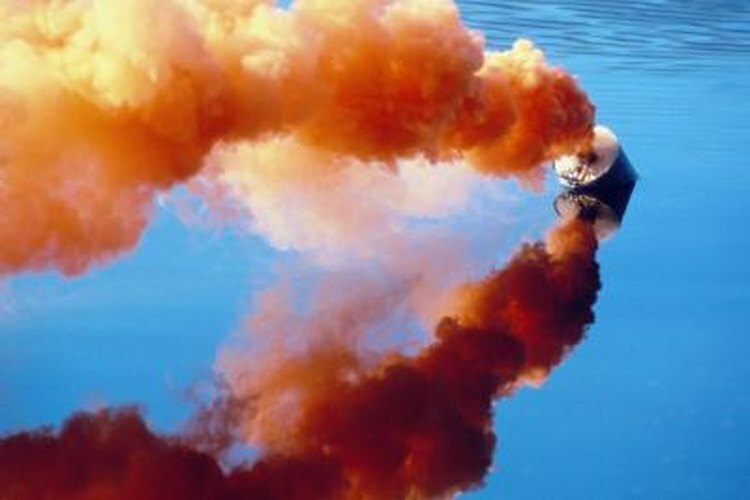 Orange smoke is a type of pyrotechnic visual distress signal recognized by the U.S. Coast Guard. The United States Coast Guard is one of the five branches of the nation's military and is charged with protecting and defending the country's maritime borders and environment. The Coast Guard also regulates boat safety in coastal waters, territorial seas and the Great Lakes, as well as any body of water directly connected to them and measuring at least two miles in width. The Coast Guard requires boating vessels to be equipped with several types of safety equipment, including flares. Flares are a visual distress signal, and as such are required on manually propelled boats and open sailboats less than 26 feet in length and with no engines. Flares are also required on recreational vessels less than 16 feet long, as well as any boat taking part in a parade, regatta, race or other event. Vessels must carry at least three day flares and three night flares. The Coast Guard recognizes four basic types of pyrotechnic devices among its approved visual distress signals. Handheld red flares are the most well-known, but parachute flares and aerial red meteors, both of which are fired from launchers or flare guns, are two other types. The fourth is orange smoke, which may be floating or handheld, and which is used only during the day. Each flare must be marked with numerous pieces of information, including the name of the manufacturer and location. The type of flare, its burning time, and its intensity in candela must also be marked, as should the date of manufacture and expiration date. The lot number, Coast Guard approval number, and basic operating instructions should be included. Safety of Life at Sea convention regulations require that handheld flares and rocket flares be encased in a water-resistant container, burn with a bright red color, and carry simple instructions or diagrams illustrating their use. Rockets should achieve an altitude of at least 300 meters before releasing their parachutes, which should then burn with an intensity of no less than 30,000 candela. Hand flares should have an intensity of no less than 15,000 candela and should burn brightly for at least a full minute. They should be able to continue burning for at least 10 seconds under water.